Someone who reads my blog alerted me to this lovely advent calendar. What is unusual about it is that it marks the days until Yule, or the Winter Solstice on 21 December, rather than the days leading up to Christmas on 25 December. 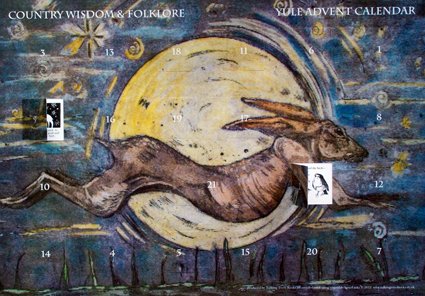 The Country Wisdom and Folklore Yule Advent Calendar is by Talking Trees Books. As well as having a lovely picture of a running hare on the front, the windows open to reveal details about country lore. Talking Tree Books also produces a Country Wisdom and Folklore Diary. Cool! Just ordered one of those. I personally don't believe in witch stuff or anything remotely related to supernatural, deep down inside I want to. But I'm just a girl who watches too much of television. And for all I know It's trying to take its toll on me. It won't really hurt trying those spell stuff anyway. I want to. Not just for fun I add. I got something of mine confiscated , something small but means a lot to me, I searched for it everywhere. Vain attempts. 'The confiscators' won't budge either. So does a 'location spell' exist by any chance? My advent calendar just arrived. It's lovely! Thanks for the info. Glad it arrived and is as nice as it looks in the picture!